Most casino sites require that the player access their services online. There is nothing wrong with that, but in areas where there is no connection to the internet, such as on bus journeys, the game must come to an abrupt end. That is one of the reasons why actually downloading the game of choice and having it on the hard drive of a tablet or laptop is a good idea. There are also many first time offers available from online casino sites across the net, but what many people have found is that after the first promotion or all of the virtual or fun money has gone, the range of benefits is limited to prize draws and raffles. The real money is on the games that people download our casino experience for, such as the card tables and the roulette wheel. We also like to make sure old and new players are rewarded for their loyalty with regularly updated promotional offers. The range of choice on our downloadable casino package is part of the reason that our customers stay with us. All of the traditional casino gems are there, including video poker, craps, roulette and slot machines, all of which are popular with experienced gamers and new. The various styles and variations of the games are also available to play, such as American or European roulette and three or five wheel slots, with a range of bonuses and formats. Video poker and the classic black jack table are staples of any traditional or internet casino sites, with the card table offering variations such as 21 and pontoon to its players. 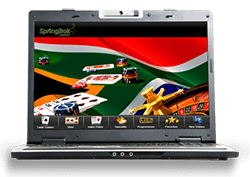 New casino sites offer fun money, but Springbok offers its chinas access to fun mode, which is a great tool for refining game plans and strategies. One of Springbok casinos most popular promotions is available now from the site and players can deposit 200R and receive triple that amount back and if that is not kwaai enough them player also gets their original stake to play with. That is 800R for a mere 200R deposit, a win before even starting. To take advantage of this offer read the details on our site for further information.